CLEVELAND (AP) — When the challenge arose in August, the Houston Astros responded like champions. They’re doing it again in October. Two months ago, last year’s World Series winners hit one of those predictable lulls that every team encounters during the dog days of a season. Maybe feeling a bit overconfident and invincible, the Astros were caught atop the AL West by the Oakland Athletics, a scrappy squad that sneaked up on everyone in 2018. But just when it appeared the Astros might be in some trouble, they switched on their after-burners. After Aug. 18, Houston went 29-10 to finish with 103 wins. Showing no weaknesses while exposing Cleveland’s flaws at every opportunity, the Astros took another step toward defending their crown Monday by finishing off a surprisingly easy three-game AL Division Series sweep with an 11-3 blowout of the Indians, who were overmatched on the mound, at the plate and in the field. Houston outscored Cleveland 21-6. 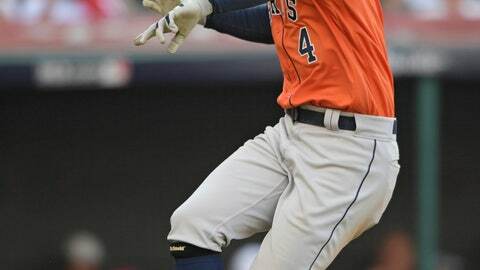 The Astros outhit the Indians .327 to .144 and banged out eight homers with making an error. The Astros, who have some time to relax and get ready for the Boston-New York series survivor in the ALCS, can win in so many different ways. They have one of baseball’s best rotations, anchored by Justin Verlander and Gerrit Cole, a devastating 1-2 pitching punch that staggered the Indians in Houston. The Astros can play long ball, small ball and any kind of ball needed with a balanced lineup loaded with contact hitters. Sure, they’ve got All-Stars in Jose Altuve and Alex Bregman, but the Astros are a selfless group that plays as one. It was Verlander in Game 1, Marwin Gonzalez in Game 2, and George Springer was among a number of deserving candidates with two homers in Game 3. Springer has found his groove at just the right time. The 2017 World Series MVP was sidelined by a sprained left thumb that landed him on the disabled list in August. He struggled after returning and connected on just three homers over the final six weeks of the regular season. The postseason is his playground. Springer hit three homers in the final two ALDS game, giving him a franchise record 10 postseason homers. “I said this to our team in there — special teams do special things in October,” Hinch said. “And I believe that about players. George is one of them. We’ve seen him come up as an uber-prospect, produce at an uncanny level, hit the lowest of the lows in the World Series and then be the World Series MVP. On a really special team. Before his team was pushed aside by the Astros, Indians manager Terry Francona sat at his office desk and described what makes them so good. “Well, besides the talent, because they are obviously really talented, I do think they do a really good job of playing until the game’s over,” he said. “Like it’s been noticeable for a while. You know some times, like I think I said this the other day, when you beat them, sometimes they just run out of time. Oddly, the Astros seem to get overlooked, lost deep in the heart of Texas amid the endless debate about whether the Yankees or Red Sox are the league’s best. Houston makes its case on the field. While he watched his young teammates party after another postseason triumph, Verlander looked like a proud father. He arrived last season to help the Astros get over the hump, and now that they have, there’s no going backward. “At no point this season was there any complacency with this team,” he said. “If I had been traded here after they won the World Series, instead of before it last year, I would have assumed this was a young and hungry team when I walked in the clubhouse.